There are many AMAZING benefits to be gained from our activities at LEAP! During a LEAP session you will experience many of the different benefits of trampolining. Trampolining is a low impact exercise that will increase your metabolism, balance, co-ordination and leave you feeling great! It is great activity for children, adults, friends and family to enjoy! We want you to have a fun and safe time with us! The rules set out below are there to ensure everyone stays safe and have a fun time. PLEASE ENSURE YOU: FOLLOW THE RULES, LEAP WITHIN YOUR OWN ABILITY & BE CONSIDERATE OF OTHERS. It is very important for your own and other’s safety that you follow and abide by our Safety Rules at all times. Always LEAP to your own ability – do not put yourself at risk and be considerate to all other LEAPers on our equipment. Our rules are displayed throughout the park and LEAP staff will be enforcing them at all times. Our staff are well trained and can answer any questions or offer any help you require during your session. LEAP Staff have the authority to remove any customers from the park should they put themselves or others at risk on our equipment by not following our Safety Rules. Please exit all our equipment once your session has finished. Our LEAP Staff will make sure to remind you when your session time has nearly expired. Should you wish to continue to enjoy LEAP’s facilities you are welcome to purchase an additional hour session. Head down to our front desk at the reception area and one of the LEAP Team will help you. Please note our Policy regarding pre school aged LEAPers: We require a paying adult to accompany any pre school aged LEAPer (4 years old and younger) on our equipment. We require the accompanying adult to actively supervise their little LEAPer during their session. Although there are many benefits from your session at LEAP – bouncing on trampolines, LEAPing onto stunt airbags, racing through inflatable obstacle courses and generally using our equipment is inherently dangerous – just like any other extreme sport. It is important that participants and parents accept these risks, take responsibility for following the rules to minimize them and to ensure all participants play withing their own ability levels. We strive to make the facility as safe as possible. Staff perform regular maintenance checks on our equipment and the Rules & Safety signs are positioned around our facility for your information. Every group of LEAPers are presented with our rules verbally by one of the LEAP Team prior to the start of every session. 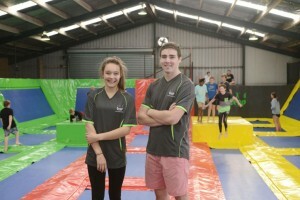 Our Trampoline Park has been built locally, by professionals, from good quality materials. But, not withstanding all that we do, we cannot eliminate the risk of injury completely. For the purpose of the Safety Rules below: ‘Equipment’ refers to the trampoline park, stunt air bag, dodgeball court, basketball areas and inflatables. The most important rule of all is to HAVE LOTS OF FUN! Only attempt flips and tricks if you have sufficient skills to avoid injuring yourself and/or others. Exit the airbag swiftly to avoid holding up the next LEAPer. Wait your turn – the green light means go! 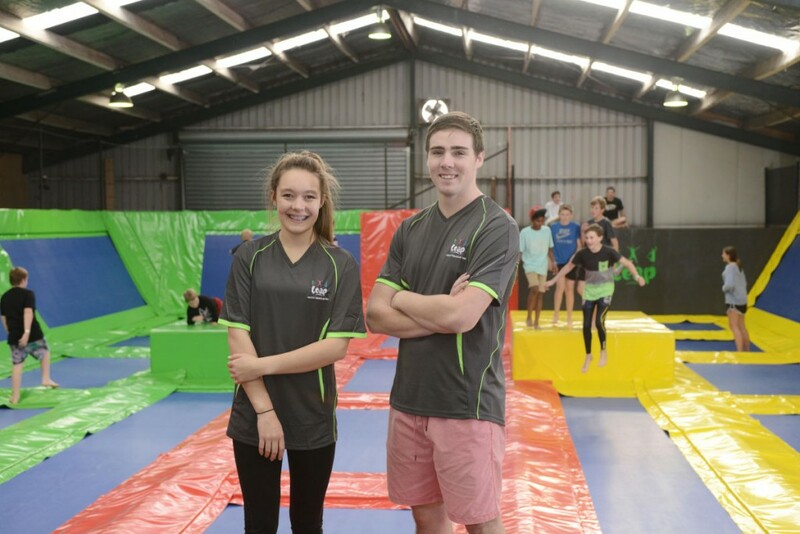 Trampolining is an EXTREME SPORT, ensure you look after yourself and others while having heaps of fun at LEAP!